It often happens this way on the farm — someone dies and someone is born, both on the same day. 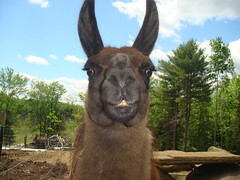 Sadly, Misty died today from a ruptured spleen, delivered by a kick from our new male llama. We had let them get to know each other, and didn’t leave them alone until there was no spitting and they were familiar with each other. But he’s a kicker — both Frank and I have hoof marks on our arms from his first days here. I’m so depressed about it. Misty was so neat. Now having lost both her and her sister Mary, I’m not sure I want to have llamas anymore. So much individual personality, and yet their benefit to our farm is intangible. The horses can take the place as guard critters. No one is going to mess with Prince or Pearl. Poor Misty. I’m glad to have known her, and she’ll be greatly missed. Right after I found Misty, I noticed that Serena had a lamb. She’s a first time mama, and did really well. Had him up and claimed in no time. I jugged them to be on the safe side, but she’s a great mama. I keep thinking we are done with lambing for the year, but because we left Spike in with his girls so long, I guess he eventually settled them after all. 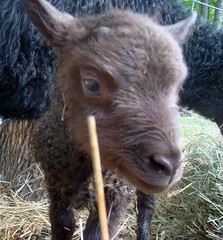 This little one is a moorit ram lamb. After her sister had a moorit ewe lamb earlier, I spoke to Mike Kelley to see if Spike carried moorit in his line, and he does. I’m thrilled. Moorit sheep are my very favorite. I’d love to have a whole flock this color. There’s only Lily left to lamb, if she’s going to. She doesn’t look bagged up at all, but who knows. This entry was posted in Death, Lambs, Llama. Bookmark the permalink. Post a comment or leave a trackback: Trackback URL. I’m so sorry, Lisa, about Misty. Very sad. Oh how sad. Poor Misty. My condolences. I’m sorry, Lisa. What a loss. I loved hearing about Misty. The picture of her with all the sheepies around her was one of my favorites. I’m sorry to hear about Misty. She seemed like such a sweetie.